Not to be confused with full dress uniform. 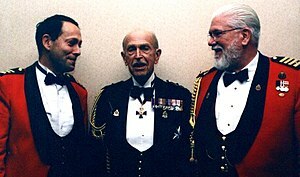 Mess dress uniform is the military term for the evening dress worn by commissioned officers and non-commissioned officers in their respective messes or on other more formal occasions. It is also known as mess uniform and, more informally, as mess kit. It frequently consists of a mess jacket and trousers worn with a white formal dress shirt and other formal accessories, though the exact form varies depending on the uniform regulations for each service. Lt Gen Pierre St Amand wearing the RCAF winter mess dress. Haakon, Crown Prince of Norway in Royal Norwegian Navy mess uniform. King Carl XVI Gustav wearing Navy m/1878 full mess dress on the occasion of the wedding of Victoria, Crown Princess of Sweden, and Daniel Westling. Swedish full mess dress (known as stor mässdräkt) is formal wear to be worn on occasions when a civilian would wear white tie or a tailcoat. The Swedish Army code for full mess dress is m/86, the navy is m/1878, and the air force m/1938. The numbers represent the year in which the style was introduced. The full mess dress is the equivalent of Dress Uniform. The "lesser" (liten) and "full" (stor) mess dress are two uniforms of the Swedish Armed Forces uniform subgroup of "social uniforms" (sällskapsuniformer). Aside from mess dress, this group also includes "formal wear" and "society wear". The Swedish lesser mess dress is the equivalent of the civilian black tie. It is the same as the British mess undress or the American mess dress blues. The use of mess dress in the United States Uniformed Services started in the early 20th century. After World War II, the evening dress and mess dress uniforms were reintroduced, with the tail coat having a single Austrian knot (trefoil) over the branch-of-service color (general officers had stars over an oak leaf braid), with the rank placed in the bottom opening of the knot. The mess jacket, intended for black-tie occasions, used an Austrian knot rank system with the branch insignia at the bottom. The number of knots indicated the officer's rank: five for colonel, four for lieutenant colonel, three for major, two for captain, one for first lieutenant, and none for second lieutenant. This complicated system, which required that the braid be altered with a change of rank, was replaced with the evening coat style in 1972, using a single knot and the rank placed above the branch-of-service color. A white mess jacket for summertime wear was introduced in the 1950s. 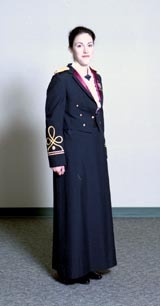 The "special evening dress" (tails) was finally abolished in 1969, although officers already in possession of this uniform could continue to wear it until 1975.It was replaced by the Army blue mess uniform, which in its modern form closely resembles that of 1911. It is common for soldiers to wear suspenders in their branch color with the army dress uniform trousers, although they are concealed under the coat. Members of the Civil Air Patrol, the United States Air Force Auxiliary, may wear the U.S. Air Force mess dress uniform with distinctive Civil Air Patrol insignia and trim. The Civil Air Patrol mess dress uniform is identical to the U.S. Air Force mess dress uniform, except that the silver braid on the jacket and officer rank insignia (shoulder boards) of the U.S. Air Force mess dress uniform is replaced with dark blue braid, and a Civil Air Patrol seal device 3" in size (either embroidered in bullion or finished in enamel) is worn in place of the middle button on the right side of the jacket. Members of the Civil Air Patrol NCO corps wear distinctive Civil Air Patrol NCO rank insignia in lieu of U.S. Air Force NCO rank insignia. Civil Air Patrol cadets do not wear the U.S. Air Force mess dress uniform, but may wear the semi-formal uniform described above for U.S. Air Force enlisted members, or a modified semi-formal dress uniform consisting of the old-style U.S. Air Force service uniform (with the four button jacket with patch-type pockets) with the name-tag removed and with Civil Air Patrol distinctive insignia, a white dress shirt, and a bow-tie (either black or U.S. Air Force satin blue). Civil Air Patrol senior members do not wear these semi-formal uniforms, but instead may wear a civilian equivalent consisting of a blue jacket, grey trousers, white dress shirt with a black bow-tie, and distinctive Civil Air Patrol insignia. Military courtesy and etiquette requirements for these Civil Air Patrol uniform combinations are similar to those of the U. S. Air Force. A United States Marine Corps Lieutenant Colonel (left) in evening dress "B" uniform. ^ Bundeswehr Dress Code, para. 262/1. ^ a b Bundeswehr Dress Code, paras. 261–264. ^ "Uniforms". Jamaica Defence Force. Retrieved 25 March 2012. ^ "The Royal Family's Attire" (Press release). 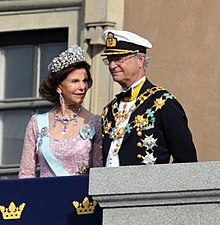 Royal Court of Sweden [Sveriges Kungahus] . 2010-06-19. ^ a b Swedish Uniform Regulations, pp. 86–87. ^ Swedish Uniform Regulations, p. 43. ^ yeomenoftheguard.com - gentlemen at arms. ^ Trendell (1921), pp. 23–26. ^ Trendell (1921), p. 192. ^ Carman (1977), p. 90. ^ Barthorp (1984), p. 173. ^ War Office (1911), Sections 578–582. ^ Newark (1998), p. 129. ^ "Rifle Dress Guidance" (PDF). British Army. Archived from the original (PDF) on 2011-11-12. Retrieved 2 July 2012. ^ Barthorp (1982), p. 137. ^ "Royal Air Force Tartan". kamrafa.co.uk. Retrieved 8 August 2009. ^ "Sir Bernard Hogan-Howe (L), Commissioner of the London Metropolitan Police Service, arrives at the Lord Mayor's Banquet at Guildhall in London, Britain, 11 November". Alamy. Archived from the original on 16 July 2015. ^ Rosignoli, Guido. Army Badges and Insignia Since 1945. Book One. pp. 138–139. ISBN 0-7137-0648-1. ^ a b Marine Corps Uniform Regulations. "MCO P1020.34G, with Changes 1-5" (PDF). www.marines.mil. Retrieved 29 July 2017. ^ "USMC Men's Boat Cloak | The Marine Shop". www.marineshop.net. Retrieved 2017-07-29. ^ "Female Boat Cloak | The Marine Shop". www.marineshop.net. Retrieved 2017-07-29. ^ "United States Navy Uniform Regulations". Archived from the original on 25 May 2009. Retrieved 2 July 2012. ^ "Two Black Tires: Fractured Prune and Arlington Uniform Shop". twoblacktires.blogspot.ca. Retrieved 2 July 2012. 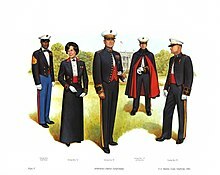 ^ "United States Navy Uniform Regulations-Tailcoat, Formal, Blue (Male Officers)". Archived from the original on 3 July 2008. This coat may be prescribed for males, captains and senior, to meet certain unique protocol requirements.